Create Caribbean Research Institute has served students and scholars of the Caribbean and its diaspora since 2014. First partnering with Dominica State College, and then extending to regional and international collaborations, the research institute uses values, theories and methods of digital scholarship to encourage young citizens of the Caribbean to learn more about Caribbean history, culture and society, and to use that knowledge to be more engaged in improving their local and extended communities. In September 2017, a Category 5 Hurricane Maria hit the island of Dominica and devastated more than 90% of the island, including the Dominica State College campus where Create Caribbean has its flagship office. 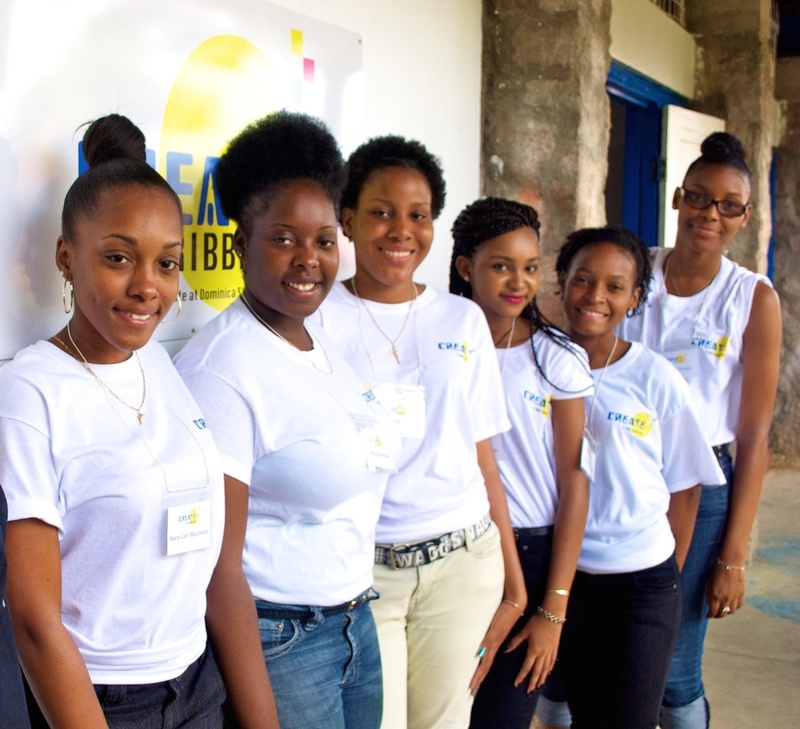 With the major loss of equipment and damage to the building, and amidst more significant personal losses as a result of the hurricane, the Create Caribbean team faced a daunting road ahead – the reality of having to start all over; to recreate what had been built with grassroots efforts in the previous three years. Currently, our primary digital research project is Carisealand, a comprehensive exploration of environmental sustainability efforts in the Caribbean, with a special focus on mapping a database of regional resources that actively support or raise awareness about sustainable development in the era of climate change disaster. This project began in 2015 as a collaboration with author and environmental activist Oonya Kempadoo, and was a topic of discussion for the interns’ research colloquium mere days before the hurricane hit. The Create Caribbean team spent the months following Hurricane Maria re-orienting its student interns to normalcy in their academic and personal lives, rebuilding the physical space that houses our Dominica office and getting back to the business of bridging research, technology and community. Our work in the 2017-2018 academic year was made possible because of the generous support of Friends of Create Caribbean near and far in our GoFundMe Campaign, donations of space, time and other resources from local institutions including the Government of Dominica, Convent High School and Altitude Construction Inc., as well as a number of individual and institutional donors in the other parts of the world including the United States and the United Kingdom. As a result of the generous support, we were able to cover our roof and repair the office and classroom, replace much of the essential technology required to continue our digital scholarship, and restore the confidence of our team to be able to offer our popular Create and Code Summer Tech Camp for children ages 7-16 in July 2018. This year’s camp was an absolute success for all involved. We continue to place high priority on our message of community accountability, sustainable living and planetary responsibility as our new normal in our research, community outreach and our daily practice as the Caribbean. Now more than ever we see the need to use the technology available to us to increase awareness, especially among students, of the impact of climate change on our communities and the complex web of relationships between climate change disasters and other areas of our socioeconomic, political and historical conditions as people of the Caribbean. The Carisealand project has now expanded to include multimedia research documentaries on topics including Agriculture, Food and Water Security; Marine Life Preservation; Public Health and Pollution; NGOs and the Aid-Industrial Complex; Environmental Law and Policy; Preserving Culture, Information and Heritage, among others. Additionally, the project will include a special 3-D mapping speculative element called The Lab, in which we attempt to reimagine and digitally render the future of our communities to mitigate and resist the imposition of climate change. The Lab begins with the consideration of Mahaut, Dominica, a small coastal community and will include, in its final stages, a concept design that demonstrates the intersections of economic, social, environmental and political factors on people’s daily lives as they deal with man-made and natural disasters. Create Caribbean hopes that The Lab can serve as a model for reimagining other communities in the region as a contribution to national and regional efforts toward sustainability. During the 2018-2019 academic year, Create Caribbean will also establish and formalize important expansion efforts in other territories of the Caribbean and with a range of academic institutions and community organizations. These initiatives will be announced on our website and social media platforms. Create Caribbean Research Institute extends thanks to everyone who has supported our recovery and our mission. We hope to continue to curate aspects of Caribbean lives and experiences in ways that make positive contributions and agitate restorative and reparative change. With your support, we will continue to bridge academic excellence, tech empowerment and civic engagement to build a better Caribbean. Create Caribbean Inc. is pleased to announce a new addition to its management team. The Research Institute at Dominica State College welcomes Dr. Hermancia Eugene as its Assistant Director, who will support the work of the Institute in the areas of research and academic program development. Dr. Eugene completed her Ph.D in Molecular Virology Microbiology at the University of Pittsburgh and her Bachelors of Science in Biology at Cameron University. She has authored multiple published chapters and journal articles including “Rhesus macaques vaccinated with consensus envelopes elicit partially protective immune responses against SHIV SF162p4 challenge”. After completing her graduate work, Dr. Eugene returned to the region in hopes of exposing our young people to the opportunities that she had for growth. Dr. Eugene is currently a biology lecturer at Dominica State College (DSC). During her years at DSC, she has also been involved in student development outside of the classroom. She is presently the advisor for the Biology Club and assists with the Environmental Club and DSC Ambassadors. Dr. Eugene has also mentored students applying for Student Program for Innovation in Science and Engineering (SPISE) and Sagicor Visionaries Challenge. Her interest in student development has led to her being active in graduation and orientation committee and now she serves on the Academic Council of Dominica State College. Dr. Eugene brings with her a wealth of scholarly experience in the natural sciences and public health, which will allow the Research Institute to expand its services in these areas of much-needed national development. Additionally, her previous work with mentorship programs makes her uniquely qualified to work closely with the Dominica State College student interns in Create Caribbean’s Research and Service Learning Program. As Assistant Director, Dr. Eugene now also holds the position of the Dominica State College representative on Create Caribbean’s Advisory Board, which consists of local and international scholars and practitioners of research and technology. The Director, advisory board, staff and students of Create Caribbean Inc. enthusiastically welcome Dr. Eugene. We look forward to her contributions toward the Institute’s growth and its enhancement of the Dominica State College community. Despite the rainy start to the day, Create and Code kicked off its April one-day workshops and introduced its new characters and curriculum to a group of excited and dynamic students. The day was an intimate and productive exchange for this small and wide-eyed group of youngsters, who focused on game and mobile app building using MIT-developed software. If you missed this Create and Code experience, the fun’s not over. Boys and girls can join the fun on Saturday, April 16 and there will be a special girls-only session on Saturday, April 23! Check out the new Create and Code portal to register online! One Year Later: Thank You! July marks the official one-year anniversary of Create Caribbean’s operations in its partnership with the Dominica State College. This year has been an exciting and dynamic one. We’ve served the college, public and private sector, students and wider community through a number of initiatives and programs. Our Create and Code technology education curriculum is a gateway for young students into technology and coding, and into their future as college students in whatever field they want to pursue. We’ve completed 5 Create and Code activities, 4 digital media outreach sessions with other non-profits, 3 faculty workshops, 3 student workshops, 1 international student exchange program, recruited and maintained 10 DSC student interns (5 of whom are preparing for the workforce with new skills and networks, and we’ve begun and been commissioned for 6 academic/policy research projects. We want to thank every single person who has made this year possible – Dominica State College; Dominica National Petroleum Company; The Chronicle newspaper; DesignStudio;Nature Island Literary Festival; Ricardo’s Mechanical in NYC; Ministry of Information, Science, Telecommunications and Technology; Division of Culture; Dominica Public Library: Roseau and the Documentation Centre/National Archives; advisory board members, and every family, friend, student and parent of the Create Caribbean community who has contributed to the success of this first year. We’ve made it through some of our toughest challenges. We’re more than ready for greater success! From all of us to all of you, THANK YOU! Create and Code Summer Tech Camp! The summer is here and we’re sure you’re looking for something to occupy your children’s time and attention. 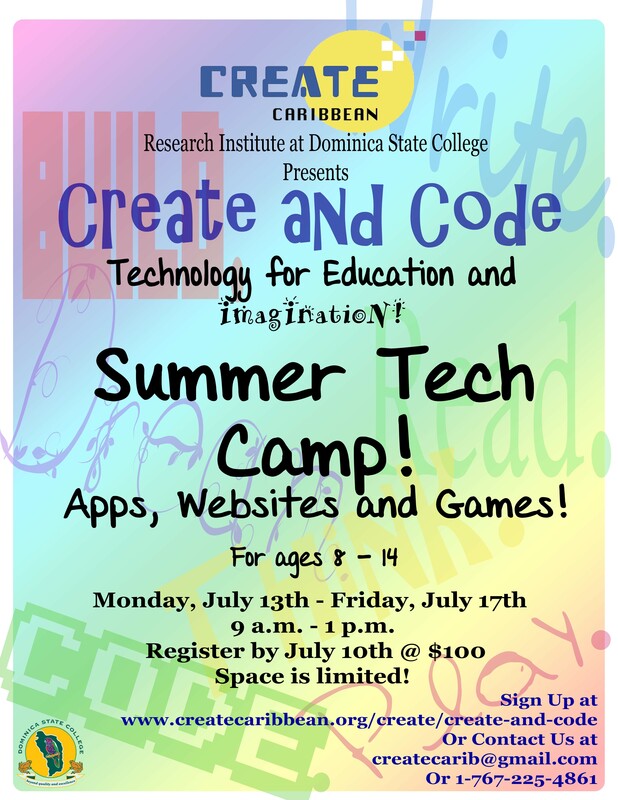 Join Create Caribbean Research Institute for the Create and Code Summer Tech Camp, a week-long program where they will learn how to code to build games, apps and websites. Students will apply their knowledge of a number of programming languages to design tech products for social awareness, on a range of issues of importance to their schools, their neighborhoods and the wider Dominica community. Sign your kids up today on our Create and Code page. Reserve your spot by paying early and registering at the Roseau Public Library! From May 17 – 25, students from the Jazz Studies Program at Western Michigan University in Kalamazoo, MI, USA immersed in Dominican culture, music and Caribbean living. Create Caribbean Research Institute had the honour of partnering with WMU’s band Mas Que Nada (MQN) as part of the Jazz and Creole Exchange Program, which culminated in the band’s performance at one of Dominica’s major festivals, Jazz n’ Creole, on Sunday May, 24. Members of the band got to experience first-hand the traditional musical sounds of Dominica, with Jing Ping tutorials (including dance lessons) provided by the Flamboyant Cultural Group of Dublanc, and later learned African drumming techniques from cultural practitioners, RasMo Moses and Gregory Rabess. MQN also got to attend some of the fringe events of the Jazz n’ Creole week, including a film screening of the 2004 production of Martinique, Biguine, which tells the story of the blending of African/Creole folk and traditional French musical sounds during the late 19th Century. Mas Que Nada invested in true academic exchange by providing performance workshops to high school students and other organized bands in classical and jazz techniques. In attendance over the two days of workshops were students from Convent High School, Isaiah Thomas Secondary School, St. Mary’s Academy, Dominica Cadet Corps Band, Music Lovers Government Band and Marie School of Music. Students of the Dominica Institute of Fine Arts were also treated to an opening performance by the band at their end-of-year ceremony. Besides the academic and performance aspects of their trip, band members got an opportunity to luxuriate in Dominica’s natural beauty, with visits to Trafalgar Falls, Titou Gorge, Scotts Head, Champagne snorkelling, Botanic Gardens, and of course, the Cabrits National Park where they opened the main stage Jazz n Creole event on Sunday, May 24.